Learn about the best ways how to find torrents, including by using torrent search sites. You can find torrents you are looking for in many ways including torrent search sites. To find torrents, it is better to use the best torrent search sites rather than general Internet search engines, such as Google or Bing. This is because torrent search sites are essentially search engines specializing in torrents and usually only in torrents. However, it seems like just when you’ve found a favorite torrenting site and gotten comfortable with its layout and search functions, BOOM, it gets taken down. The bigger and more popular a torrent search site gets, the harder and faster it falls. But what can you do? That’s the nature of the business. And that means torrenters are always on the lookout for the next great torrent search site. The moment one site gets taken down,the next in line gets a massive surge in traffic. Enough blah, blah. Take me right to the best torrent search sites already! Last year was the most hectic year yet for torrent search sites and their users, and there’s no reason to believe the future will be any different. By this time next year, expect to see some torrent sites rise, some fall, and some disappear entirely. But it’s not just site owners that are being targeted for takedown. Torrent users, like you, are vulnerable too. That’s why you should always use a VPN when you torrent, no matter which one of these sites you use the most. A good VPN will keep you safe from all prying eyes, whether your Internet service provider, snoops trying to monitor torrent use or even the powers that be. Use one of these outstanding torrent-friendly VPN services to find & download torrents safely without having to look over your shoulder. The best torrent indexing site(s) for you to use will depend on the type of content (the torrent "payloads") you are looking for, whether movies, music, apps, video clips, games, books, erotica, images, etc. Torrent indexing sites are usually searchable and browseable. This means that you can search for torrents by keywords (just like any search engine you are used to), but can also explore a structured set of categories which are sometimes further divided into sub-categories. For example, Torrents > Movies > Horror. In particular, community-based torrent indexing sites offer a number of additional advantages. Members of these communities post comments or verify torrents which can help you to screen out poor quality, copyright, fake or malware-infected torrent content. Most torrent search sites will also display the number of seeders and leechers for each torrent. Usually, they just use the term "seeds" or "S" for seeders and "peers" or "P" for peers (aka leechers) , even if technically a seed is also a peer. Remember that a torrent downloads fastest the higher the ratio of seeds to peers. Believe it or not, this means that a torrent with 2 seeds and 1 peer will download faster than a torrent with 10 seeders and 10 peers. The great thing about torrents is that nothing about downloading them depends on the search site you use. The process for downloading torrents is almost always the same. If there’s something you’re looking for to download, chances are one of these sites has it. The powers that be may be able to take the wind out of The Pirate Bay's sails, but they just can’t seem to sink it. The infamous torrent search site was forced to dock at another web address for a while, but now they’ve even managed to wrestle back their old thepiratebay.org domain name. And torrenters love to see that TPB flag flying, because this particular site is packed to the brim with treasures, from movies to music to TV shows. The interface is a bit sparse and old-fashioned, but that's better than lots of pop-ups or pop-overs. Top Tip - Be careful of other dodgy websites trying to capitalize on the kickasstorrents name recognition. The scam copycat sites will try tricking you into clicking on ads or downloading malware. The change in KAT’s domain name didn’t stop millions of downloaders from rushing back into the site’s arms the moment they announced their return. That’s probably because KAT’s combination of a massive library of user-reviewed file releases means you can avoid the crap and spam and find pretty much anything you want there – and even some stuff that you didn’t know you wanted but are excited to discover and end up downloading anyways. Though KAT’s current site ranking doesn’t quite stack up yet, we’re sure they’ll climb back near the top in the coming months once word gets out of their triumphant return. The struggles of KickassTorrents and Torrentz in 2016 benefited ExtraTorrent, since it catapulted them up the charts as millions of torrent users searched for an alternative torrent search site to those taken down. And there’s a reason they chose ExtraTorrent. For one, it has always had a great community, as well as one of the best selections of torrent files in the business. Are you a movie buff? Then you’ll love this next entry on the list, because there are few torrent sites that do movies as well as YTS. They’ve got a huge selection, great interface, and even the ability to choose from many different file qualities, whether it’s 720p, Bluray, or even 3D. And when we say “great interface”, we mean YTS is way prettier than most of the other sites on this list. It looks more like Netflix than some bland torrenting search site. Keep in mind that this YTS isn’t run by the same people as the original YTS or YIFY sites back in the day. Using a brand name they didn’t create has earned them the ire of some insiders. But this shouldn’t concern for the average torrent user. Afterall, most of us just want to find, download and watch some good movies, and not worry about torrent politics. Unlike most fallen torrent sites, the very popular Torrentz closed their doors voluntarily. But they’d built up such a fan base before shutting down that another group of torrenters decided to take up the mantle and carry on the Torrentz legacy, only this time under the name Torrentz2 (note the ‘2’ tacked on the end). But they’re not stopping there. The new owners have intentions of making the new torrent search site even better than the old one. Considering that the original was already one of the best torrent sites on the web, it’ll be good news for torrenters if they succeed. We wish them luck! RARBG was originally founded in 2008 in Bulgaria, but it has slowly grinded its way up the site ranking charts and into the hearts of the hundreds of thousands of its daily visitors. In the meantime, their servers have had to be relocated a few times to avoid the unwarranted attention that comes with being a popular torrent search site. One thing that sets RARBG apart is its focus on quality over quantity, with large, high-quality files sizes being the norm. The site also has a loyal and longstanding community that keeps its files current and always monitors them for quality. You may have even noticed files with RARBG tags floating around on other torrent sites. But RARBG also happens to be very beginner friendly too, so you don’t have to be a torrenting veteran or pro to join the fun. This torrent site has gone through its ups and downs over the years, but it has clearly come out intact, since it’s currently one of the most highly visited torrent search websites on the internet. Part of that bump came when KickassTorrent closed, but 1337x was still quite popular even before that. They may not have the newest torrents, but they do have a lot of great older stuff to choose from, whether it’s movies or games or… well, pretty much anything. As the name suggests, EZTV specializes in TV shows and series. You might not find the sheer number of torrent files as you’d find on some of the other major sites listed here, but you can usually count on the quality and being current almost up to the hour when it comes to television. Be aware that there is a little controversy surrounding the site: the current owners actually took the site over from the original creators back in 2015… and on less-than-friendly terms. But that kind of drama won’t affect the average torrent user at all. Demonoid is the first and only private torrenting site on our list. While places like The Pirate Bay and KickassTorrents are open to the everyone, you’ll need an account to access Demonoid’s torrent search library. And the only way to register for an account is through an invitation received from an existing member or during very limited open registration periods. But private torrent search sites do enforce seeding ratios, meaning members are required to seed a certain amount of data to earn credit they can use for downloading. 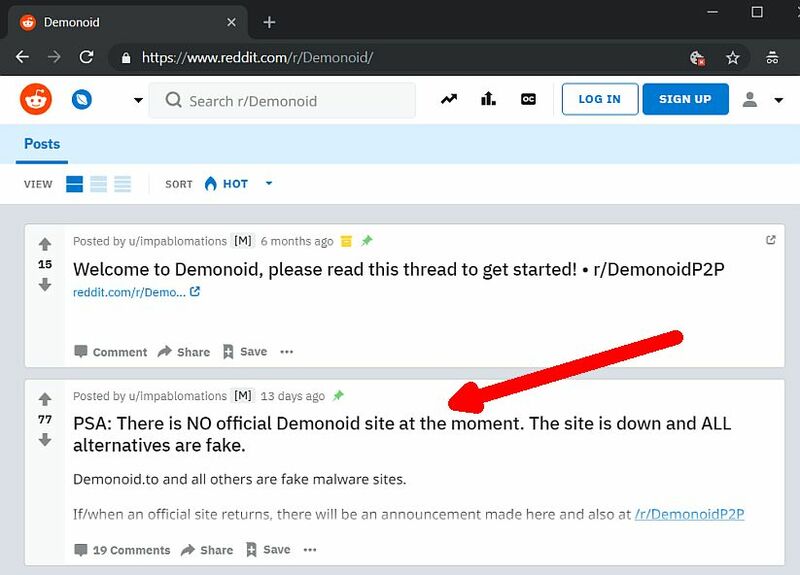 With everything it is has got going for it, this is why Demonoid still manages traffic numbers that aren’t far off from the biggest public torrent search sites even with its restricted number of private users. 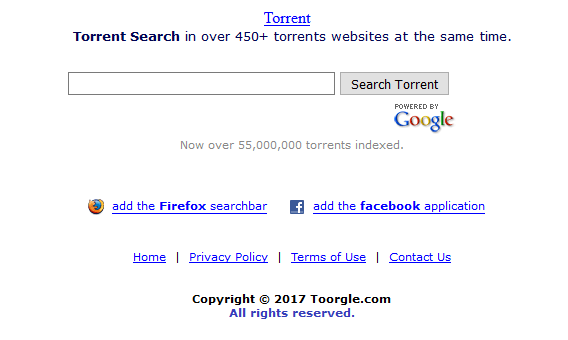 While Toorgle may not be as widely known or visited as some of the other torrent search sites on our list, it fills a pretty unique niche in the market. It is a torrent meta search engine that works kind of like Dogpile – but for torrents. Whatever keyword or phrase you search for is run through 450+ different torrent websites, returning tons of results from across the web. This can really come in handy when you’re searching for more obscure or hard-to-find files, whether it’s old or foreign movies, random TV shows, or indie games. The only drawback is that some of the results can send you to some rather sketchy torrent sites, so pay close attention to what you’re clicking on or downloading. Different torrent search sites than those summarized above can also be found using a general Internet search engine and typing terms like “most popular torrent indexing sites”, “torrent search engine” or even simply “torrents”. Sometimes you need to go looking and dig a little for torrent indexes because they get taken down, have their domain names seized or simply change or move. Top Tip - Although Google is the most popular search engine, try using alternative search engines that better respect your privacy and don’t track you, such as DuckDuckGo and Startpage​. Always remember that many, if not most, popular torrent search index sites are not copyright safe (see below). Too often, the most popular torrent indexing sites include torrents associated with pirated materials. In addition, some of the most popular torrent index sites have very cluttered pages, trying to entice you into clicking on all kinds of ads, downloads and other links, not all of which may be safe or desirable. In fact, your browser may display a warning page when you try visiting a popular torrent index. If you are blocked from accessing torrent indexes - whether by your government, ISP or your geographic location - try accessing them with Tor, a proxy or a VPN service (virtual private network). Top Tip - If the risks above sound like a headache, do yourself a favor and download torrents safely and anonymously by getting the top-rated torrent VPN NordVPN. Its 30-day money-back guarantee means you can try it risk-free. BitTorrent’s Featured Content https://now.bt.co/ - torrents featured by the firm that invented them. A great resource as it's in their interest to offer exciting legal torrents. Mininova http://www.mininova.org/ - an easy-to-use directory and search engine for all kinds of torrent files. Internet Archive https://archive.org/details/bittorrent - movies, music, games and books that are now in the public domain (lots of “classics” from the past). VODO http://vodo.net/ - torrents of independent (“indie”) film and movies. Vuze Wiki http://wiki.vuze.com/w/Legal_torrent_sites maintains a great list of legal torrent sites, organized by category. [update: seems to be shutdown for good] ClearBits http://www.clearbits.net/ - a torrent directory of open licensed media, including movies, music, games and more. Other copyright-friendly torrent indexes can be found using a general Internet search engine and typing terms such as “legal torrent indexing sites” or “best legal torrents”. 2) if you know what an operator is (it’s a search parameter), you can employ the filetype: operator on general search engines that support it. General search engines supporting this operator include Google, Bing, DuckDuckGo and ixQuick. Note that there is no space between the colon (:) and the word torrent. Also note that it’s torrent singular, not torrents plural. Use the torrent search sites above to find what you are looking for. But heed our warnings about using a VPN for all of your torrenting activities. Remember, the snoops are out there trying to monitor your torrent downloads. Great post bro. Thanks for this post.